While this is not the only nor even probably the oldest remain of the so-called anatomically modern humans (i.e. Homo sapiens, our kin) in Eastern or SE Asia, it seems to be the less controversial one so far, what should help to consolidate our knowledge of the period of colonization of the Eurasian region East of Bengal. Uncertainties surround the timing of modern human emergence and occupation in East and Southeast Asia. Although genetic and archeological data indicate a rapid migration out of Africa and into Southeast Asia by at least 60 ka, mainland Southeast Asia is notable for its absence of fossil evidence for early modern human occupation. Here we report on a modern human cranium from Tam Pa Ling, Laos, which was recovered from a secure stratigraphic context. Radiocarbon and luminescence dating of the surrounding sediments provide a minimum age of 51–46 ka, and direct U-dating of the bone indicates a maximum age of ∼63 ka. The cranium has a derived modern human morphology in features of the frontal, occipital, maxillae, and dentition. It is also differentiated from western Eurasian archaic humans in aspects of its temporal, occipital, and dental morphology. In the context of an increasingly documented archaic–modern morphological mosaic among the earliest modern humans in western Eurasia, Tam Pa Ling establishes a definitively modern population in Southeast Asia at ∼50 ka cal BP. As such, it provides the earliest skeletal evidence for fully modern humans in mainland Southeast Asia. Some more details can be found at the press release by the University of Illinois (h/t Pileta). Liujiang skull (at Don’s Maps, at P. Brown’s site, at Bradshaw Foundation), from Guangxi-Zhuang, is clearly a modern Homo sapiens but the exact date is not known because it was originally dug with very limited means. Recent datings of nearby sediment suggest an age of 68-139 Ka but this is hotly debated. Zhirendong jaw (at this blog, at PhysOrg), also from Guangxi-Zhuang and dated to before 100,000 years ago (110,000 years ago according to first reports), is argued to be a modern Homo sapiens but its very ancient date and some unavoidable ambiguity of such limited skeletal evidence allow for some skepticism, if you are so inclined. Callao cave metatarsal (foot) bone (at Leherensuge) is dated to before 67,000 years ago and comes from Luzon, the largest Filipino island, but because of its small size cannot be ascribed to any human species safely. All we can say is that they knew how to use rafts or boats – but then Homo floresiensis (H. erectus?) did too. 120,000 years old stone tools from Japan ··> Leherensuge. 130,000 years old “African-like” stone tools from Crete ··> Leherensuge. Stone tools from Papua are at least 49,000 years old ··> this blog. Early Indians used Southern African style MSA tools c. 80,000 years ago ··> Petraglia 2007 (ppv). Growing evidence for a first out of Africa (into Arabia, Palestine) migration since c. 125,000 years ago ··> at this blog for example: Dhofar’s Nubian culture, various Africa-to-Arabia scenarios, Nefud, Arabian coastal route 130 Ka. ago; also at WP: Skhul and Qahfzeh people from Palestine (ill dated but very very old). Whichever is your personal take, it is clear that this skull adds up in support of a very old colonization of East Asia. The question is: exactly how old? D. Pleurdeau et al., “Of Sheep and Men”: Earliest Direct Evidence of Caprine Domestication in Southern Africa at Leopard Cave (Erongo, Namibia). PLoS ONE, 2012. Open access. The origins of herding practices in southern Africa remain controversial. The first appearance of domesticated caprines in the subcontinent is thought to be c. 2000 years BP; however, the origin of this cultural development is still widely debated. Recent genetic analyses support the long-standing hypothesis of herder migration from the north, while other researchers have argued for a cultural diffusion hypothesis where the spread of herding practices took place without necessarily implicating simultaneous and large population movements. Here we document the Later Stone Age (LSA) site of Leopard Cave (Erongo, Namibia), which contains confirmed caprine remains, from which we infer that domesticates were present in the southern African region as early as the end of the first millennium BC. These remains predate the first evidence of domesticates previously recorded for the subcontinent. This discovery sheds new light on the emergence of herding practices in southern Africa, and also on the possible southward routes used by caprines along the western Atlantic coast. Caprines are a focus of this research but they are only a minority (2) of the animals identified in Leopard Cave, with bovines (cows) being the most important (16) among domesticates and in general if we exclude ostrich eggshells. Unspecified rodents and birds reach similar figures to those of bovine cattle but these belong to diverse species with all likelihood. Besides animal remains the cave has also yielded a dearth of stone artifacts and some pottery. It is unclear to which modern ethnic group, if any, can the site be associated with but the area has been traditionally inhabited by the Damara people, who speak either Khoekhoe or sometimes Herero languages but who, like their peculiar Northern Neighbors, the Himba people, are generally speculated to be a different ethnic, cultural and probably also genetic stock from both Khoisan and Bantu peoples. Sadly I do not know of any genetic study on either ethnic group, which may be of great interest for ethnographic and prehistoric reconstruction purposes. Update (Jul 29): for a new study on Khoesan (and also Damara, Himba, etc.) autosomal genetics see HERE. The Archaeology Network mentions the finding of a pre-Jewish temple at Tel Haror, near Beersheba, dated to c. 1800-1550. 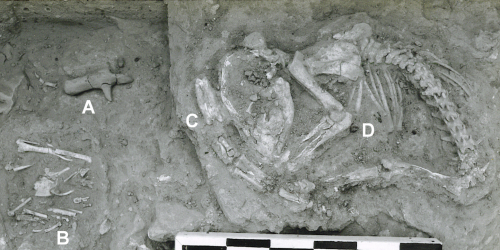 The finding is interesting because of the many sacrificial burials of young dogs and corvids. Puppies were ritually slaughtered in some West Asian religious rituals, the use of corvids is not documented however. It is also known that the Jewish mythological text declared both animals impure and that it banished the ritual of slaughtering dog cubs by breaking their necks. Some 3000 years ago the sediments of the Congo river’s mouth were suddenly altered in an unexpected way: it is the signature of the first forest agriculture, which implied opening patches of the rainforest, allowing weathering of the soil. Germain Bayon, Intensifying Weathering and Land Use in Iron Age Central Africa. Science 2012. Pay per view. The researchers analyzed the cores for elements like hydrogen that leave distinctive signatures in sediment. These geochemical markers correspond with past precipitation levels, which influence weathering. They also examined ratios of aluminum and potassium, which indicate weathering intensity, because potassium is a highly mobile element whereas aluminum is one of the most immobile. As expected, the weathering patterns closely followed precipitation levels—that is, until about 3000 years ago. At that point, Bayon says, the pattern became completely different. The sediment appeared to have undergone intense chemical weathering, which the climate alone could not explain. So the team began suspecting another factor was responsible. Hat tip to Stone Pages’ Archaeonews. Did agriculture worsen life conditions? This is the thesis proposed by Amanda Mummert and colleagues: that Neolithic was not so good, or rather that it had at least very poor trade-offs. We tend to think having regular sources of food as something good but when that means eating mostly one or two vegetable foods all year long it may well be a problem. Whatever the reason what Mummert discovered is that the health and size of Europeans suffered with the introduction of farming. Ref. A. Mummert et al., Stature and robusticity during the agricultural transition: Evidence from the bioarchaeological record. Economics & Human Biology, 2011. Pay per view. Incidentally a couple of days ago, I stumbled upon the Wikipedia page on life expectancy and I noticed that same pattern in the list of documented life expectancy variation over time: the record before the Middle Ages was in the Paleolithic period, when newborns could expect to live 33 years. Then, with Neolithic, it fell to a mere 20 years, recovering only very slowly.